China Builds Museums, But Filling Them Is Another Story : Parallels China has been building museums with abandon, opening about 100 annually in recent years. Two of the biggest opened on the same day last fall on opposite banks of Shanghai's Huangpu River. But filling these museums — with both art and visitors — is proving more challenging. 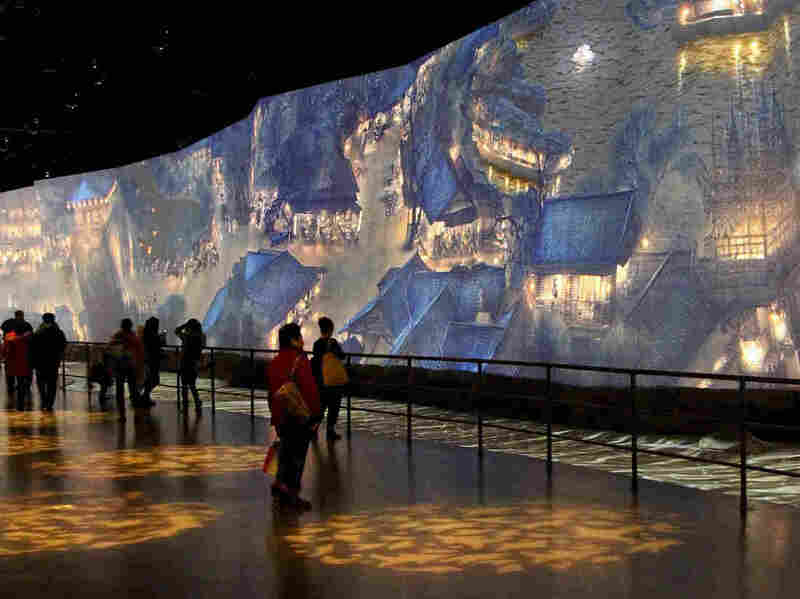 One of the highlights of the new China Art Palace in Shanghai is a giant digital rendering of a famous ancient scroll, "Along the River During Qingming Festival," which includes figures that walk and talk. The work was first presented at the 2010 World Expo in Shanghai. New York City and Paris are financial centers. They are also indisputably cultural centers of the world. Shanghai is now in that process but hasn't yet reached that level. The frenzied construction of cultural infrastructure follows earlier building binges involving roads and bridges. But it's harder to manage a museum than a highway. For one thing, you need to fill museums with worthwhile exhibits and visitors. At more than 600,000 square feet of exhibition space, the China Art Palace is about the size of New York's Museum of Modern Art. 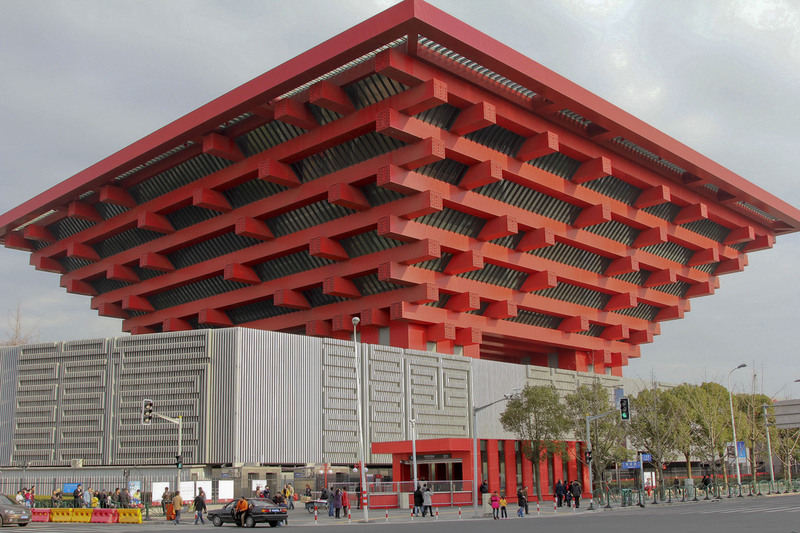 It's housed in the 2010 Shanghai World Expo's former China pavilion, which resembles an ancient Chinese roof support — or an upside-down red pyramid, depending on your perspective. The top attraction is an animated version of an ancient Chinese scroll, "Along the River During Qingming Festival," which depicts ordinary life in a Chinese city during the Song dynasty (960-1279) more than eight centuries ago. The scroll, which debuted during the World Expo, is about two stories high and more than a football field long. It literally comes to life, with figures strolling across an arched bridge or talking to each other as they push a barge out into the current. "I think it's really beautiful," says Xu Qinhua, a 62-year-old retired teacher. "When I was young, my teacher told me I should see the original, but I never had the opportunity." The China Art Palace, which is free to the public, also provides access to foreign art most people here would otherwise never get to see. Earlier this year, the museum presented an exhibition of 19th century French naturalist masterpieces from the Musee d'Orsay in Paris. The sprawling China Art Palace is housed in the former China pavilion at the site of the 2010 World Expo. It's about the size of the Museum of Modern Art in New York; admission is free. "I am here mainly to see the techniques," says Lin Weipeng, who is a painter in coastal Fujian province and has tried to copy some of the French masterworks on his own. Lin, who wears a knockoff down jacket emblazoned with "Santa Barbara Polo and Racquet Club," is holding his 9-year-old daughter, Mowei, in his arms. "She can't really understand these paintings," he says. "But I just want to give her some feeling for it. If she doesn't get to go to France, this is probably her only chance to see the original work." All of this is part of the Shanghai government's master plan to turn this mega-city into a cultural capital and magnet for global talent. A relatively sleepy metropolis as recently as the 1990s, Shanghai has made a lot of progress, developing a vibrant restaurant scene and dynamic nightlife. But the city is still primarily known in China for business and conspicuous consumption. Teng Junjie, artistic director of the city's Administration of Culture, Radio, Film and TV, likens Shanghai's ambitions to other cosmopolitan cities in the West. "New York City and Paris are financial centers. They are also indisputably cultural centers of the world," says Teng. "Shanghai is now in that process but hasn't yet reached that level." A short ferry ride across the Huangpu River is the city's other new museum, the Power Station of Art. It features contemporary work and is housed in a converted power plant with a smokestack that is nearly as tall as the Washington Monument and doubles as a giant thermometer that lights up at night. Lying along the river, the Power Station most closely resembles London's Tate Modern. Young museum-goers at the Power Station of Art check their smartphones. Engaging audiences is challenging in China, where there is no emphasis on art education in public schools. A major Andy Warhol exhibition opened here late last month. In the first week or so, the museum sold about 6,000 tickets at a little more than $3 a head. That's not many in a city of 23 million. One reason is the obscure location. The Power Station sits in a mostly abandoned section of the Shanghai Expo site that is a long walk from the nearest subway station and a mystery to most city cab drivers. A second reason there aren't many visitors is a lack of publicity. Jack Wang, a first-year medical student, came to the Warhol exhibit earlier this month, but only because a friend told him about it. "Andy Warhol, literally, I don't know his name, but I've seen a lot of his art pieces before," says Wang, who wears a gray hoodie and blue slacks. "The display of this art is really exquisite." Li Xu, deputy director of planning at the museum, thinks there is a third reason for the small crowds. When it comes to contemporary art, he says, most Chinese don't know where to begin because cultural education has lagged far behind China's economic boom. "My estimation is one-third to one-half of artworks are hard for average visitors to understand if they didn't receive sufficient art education," says Li. "Chinese graduate students' understanding of art only reaches the level of middle school students in the U.S."
To try to change that, museums are starting young. The China Art Palace runs workshops for elementary school students on subjects like naturalist painting, but getting them in the door is tough. China's hypercompetitive educational system still emphasizes rote learning and tests. Li says most schools see no practical value in field trips to art museums. "The sole purpose for parents to send kids to school is that they can get into college," says Li. "Anything that's not related to the college entrance exam will not get parents' and teachers' attention." Jeffrey Johnson, an architect who runs the China Megacities Lab at Columbia University, is among a number of scholars who study China's rapid urbanization. He says local governments are building museums to create a cultural life and competitive identity for their cities. But China lost a lot of art because of its civil war in the 1940s, as well as the Cultural Revolution, looting and overseas sales. Johnson says many museums are going up faster than curators can fill them with works and audiences. 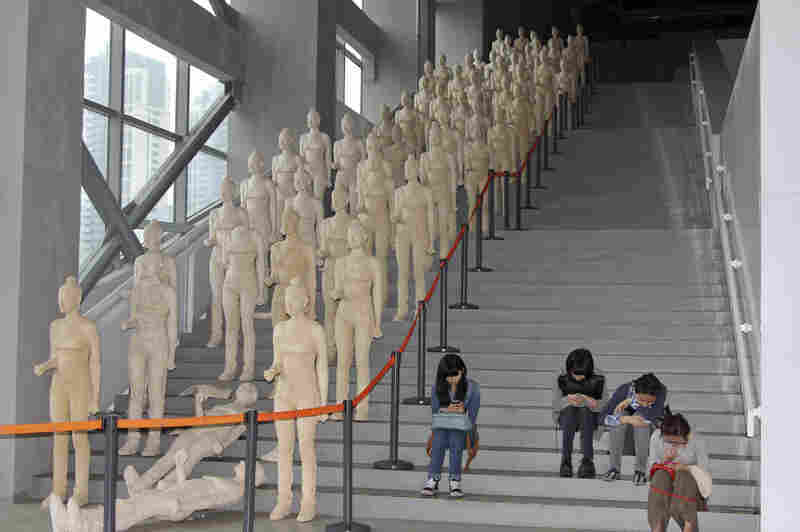 Many of China's new museums, he says, are closed or only open sporadically. "They might have a grand opening or a press conference with great photographs and government officials," says Johnson, "but if you return to this museum, which officially has been open for three months, it ... might be closed and locked." Johnson likens the museum boom to China's real estate glut in which new housing has outpaced real demand. In a crowded nation like China, though, emptiness can occasionally have its benefits. Back at the Power Station of Art, Jack Wang is enjoying a rarity here: the uncrowded public attraction. "It's great for me," says Wang, sitting on a couch not far from rows and rows of Warhol's iconic Campbell's tomato soup cans. "The environment here is very comfy and peaceful. But I think more people should have chances to come here to see this art."